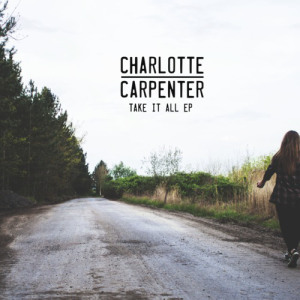 Northampton born Charlotte Carpenter has released more snippets of her undeniable talent with fourth EP Take It All. Since graduating from a Popular Music Course at Derby University the singer-songwriter has been building up wide spread recognition and support across the country and her latest offering adds even more layers to Carpenter’s growing profile. Opening track ‘Woes’ is delicately pitched and instantly makes you stop whatever else it was you were doing thanks to the downright beauty of Carpenter’s vocal that sits atop wistful guitar playing. It’s a sign of things to come with the rest of the EP bursting into life after this subtle beginning. ‘Every Now And Then’ smoothly shows us a different and sultrier side of Carpenter – there’s enough mystery and charm to the entire track that you just can’t escape the spell that the singer’s vocals trap you under. Not that you’d want to – like every other track on the EP it leaves you hanging on Carpenter’s every word and begging for more. Title track ‘Take It All’ ripples with rock intent whilst ‘If I Could’ captures dreams of breaking free through mature and heart felt lyrics. Throughout, the backing band that Carpenter now utilises to good effect creates an atmosphere around the songs that adds genuine depth and feeling. The EP closes with ‘Blood Ties,’ a mellow and melodic finale to what is a sure elevation to the spotlight for this beautiful singer who has honed her songs to perfection. Carpenter’s voice blows you away, meanders into your senses and cuts into your soul like no-one else. You won’t be disappointed by a single moment of this wonderful and absorbing EP.